THOMAS G. PLANTE, PhD, ABPP, professor of psychology at Santa Clara University and adjunct professor at Stanford University School of Medicine, has written or edited twelve books and has published over 150 journal articles and book chapters. He maintains a private clinical practice as a licensed psychologist in Menlo Park, CA. PART ONE Foundations and Fundamentals. 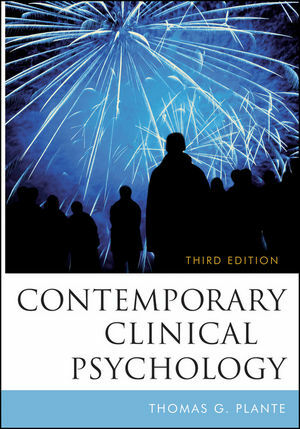 Chapter 1 What Is Contemporary Clinical Psychology? Chapter 2 Foundations and Early History of Clinical Psychology. Chapter 3 Recent History of Clinical Psychology. Chapter 4 Research: Design and Outcome. Chapter 5 The Major Theoretical Models: Psychodynamic, Cognitive-Behavioral, Humanistic, and Family Systems. Chapter 6 Integrative and Biopsychosocial Approaches in Contemporary Clinical Psychology. PART TWO Roles and Responsibilities. Chapter 7 Contemporary Psychological Assessment I: Interviewing and Observing Behavior. Chapter 8 Contemporary Psychological Assessment II: Cognitive and Personality Assessment. Chapter 11 Areas of Specialization. Chapter 12 Consultative, Teaching, and Administrative Roles. PART THREE Where Is Clinical Psychology Going and Should I Go with It? Chapter 14 Current and Future Trends and Challenges. Chapter 15 Becoming a Clinical Psychologist: A Road Map. Appendix: Ethical Principles of Psychologists and Code of Conduct 2002.